I found this blog post on basemaps over at the 41Latitude blog (if you aren’t following this blog you need to start right now) to resonate with me. perhaps, in trying to make a basemap that’s optimized for everything, we’re actually creating one that’s optimized for nothing. We all see it quite a bit these days. Some data overlaid on a default Google Map and you can’t read a darn thing. 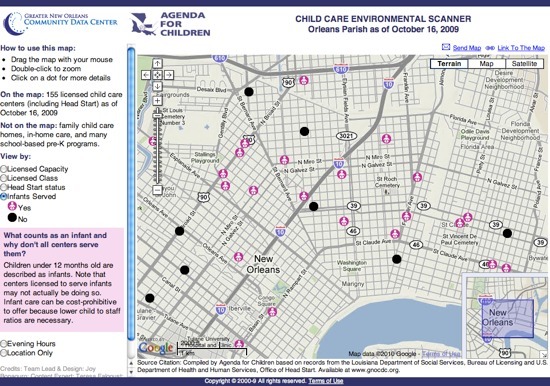 Working for the GNOCDC, we picked the Terrain map as our basemap (even though there is no “terrain” in NOLA) because it was the least cluttered basemap. Over in the ESRI world, I’ve had a couple people ask me to put their data on the Esri Topographic web map servicebecause it looks so good. Now I do agree, it is a beautiful basemap, but it isn’t one that lends itself to being a basemap. Esri should be offering a muted basemap and allow for the most important part of the data, the information being overlaid, to stand out.